What does a belay jacket have to be? Warm. And it’s that, especially for synthetic, as two friends and I who have test-driven it at our winter crag agree. Was it an “aha” moment? Or just a duh? For years the manufacturer Big Agnes (named for a peak near Steamboat Springs, Colorado) has been making sleeping bags, its watchword being “comfortable.” One day somebody got the idea to wrap those solid sleeping bags around us as jackets. The company debuted two down pieces in fall of 2013. For fall of 2014, it fluffed up the offerings to include two more down jackets and two synthetics. 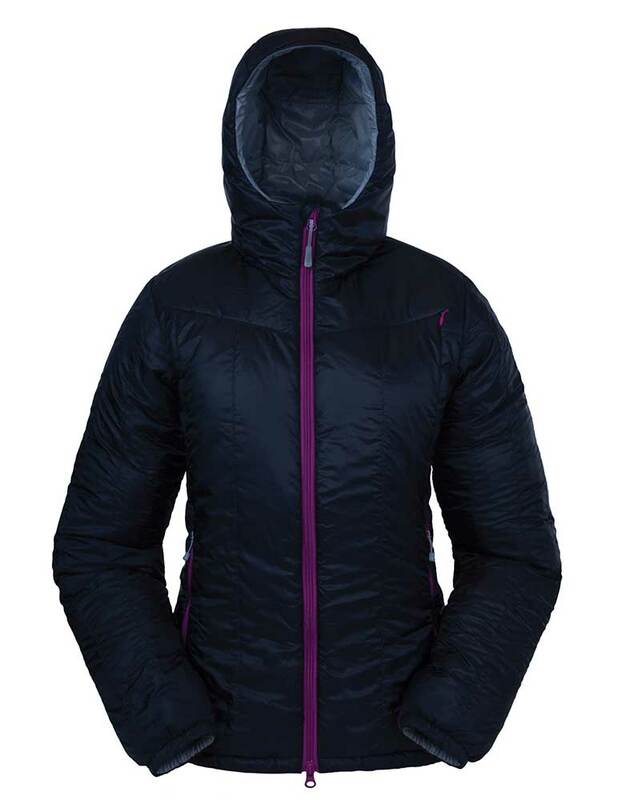 One is the Women’s Hot Sulphur Belay Jacket (for men, see the Men’s Dunkley Belay Jacket, same price). Here’s another question. What does a belay jacket have to be? Warm. And it’s that, especially for synthetic, as two friends and I who have test-driven it at our winter crag agree. The company uses Pinneco Core, same as in its sleeping bags (and is the only one to use the material in a jacket), designed to breathe and to draw out moisture. I found the poly shell, which is recycled, to be windproof but have not had the weather to check it for water-resistance. Belay-friendly features include a hood that fits over a helmet, though only just, and a two-way zipper that can unzip upward to accommodate a belay device. The zippers have long fat pull-tabs that you can handle with gloves, and the one that comes up to your nose tucks under a cloth flap, to avoid cold metal scratching. Adjustable wrist cuffs can fit over your gloves. The jacket is a simple, functional straight cut, quite supple; the fabric has a smooth hand. Being the farthest thing from an alpinist, I really hope I never have to climb in this jacket, but could. 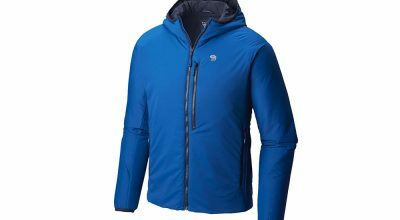 The jacket has an outer zippered chest pocket that I rarely use, a roomy zippered inside pocket into which I plunk things all the time, and interior mesh stash pockets I don’t use simply because they don’t zipper and four other pockets do. The two side pockets are padded for hand warming. The garment’s sizing is a bit generous (the men’s version brought to the office for review seems to be true to size). As a shoulder-y person I usually verge between medium and large, but a medium is fine, and the arms are nice and long. My friend who trends between small and medium is similarly well housed in a size small. 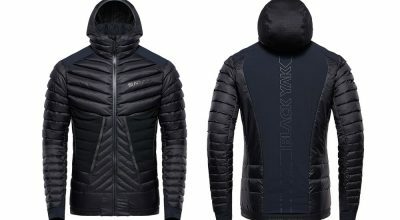 The jacket will not compress the way a down jacket would, but unlike down is designed to fend off drizzle and other raw ingredients. 4 stars. Simple, clean jacket with a trim fit, and it’s warm. I cannot yet credit it for water resistance, being as my state (geographical) at the moment has stopped precipitating, affording no opportunity thus far to check. We need snow for Christmas. How about you? Padded hood fits over a helmet. Two-way zipper parts upward to make way for a belay device. Simple, straight cut with vertical baffles. Fabric handles nicely. Insulation comprises a breathable membrane and fiber layers to wick moisture. 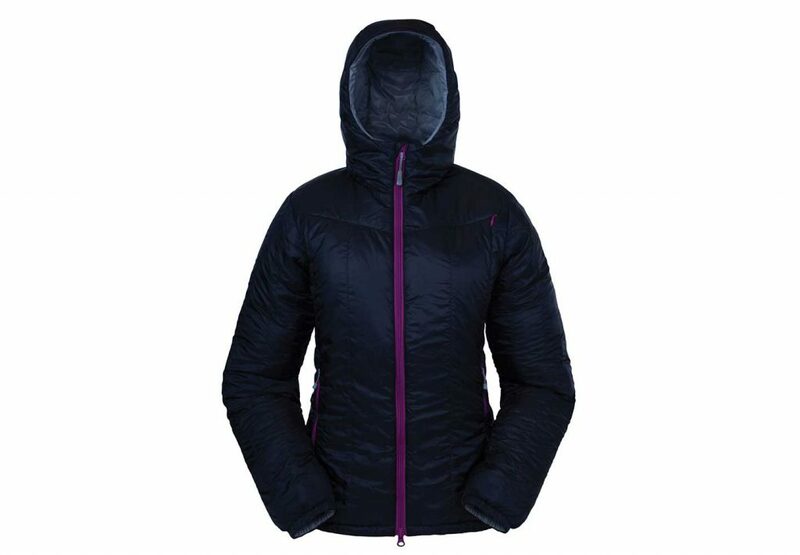 120g synthetic insulation in body, 80g in sleeves. What is the coldest or worst place you have ever belayed? Best story wins a free Women’s Hot Sulphur or Men’s Dunkley belay jacket. Write your best belay story in the comment section below to enter. U.S. Shipping Address Required.